Fast ForWord: Does it Really Work? I have been exposed to the Fast ForWord® program for several years. I was introduced to the program during my Clinical Fellowship (first year of work after grad school). I worked at a private practice in Pasadena, CA. The owner of the private practice was a veteran in implementing the program and used it with a wide variety of students with disabilities ranging from mild auditory processing to severe autism. My first reaction on viewing the program was skepticism. How can any computer program take the place of a real, live clinician? How can sitting in front of a computer for an hour a day fix all the language and learning problems? Now, 12 years later, as an owner of a private practice and a Fast ForWord provider, my perspective hasn’t really changed. Fast ForWord cannot (and wasn’t designed to) take the place of a therapist, nor can it truly “fix” all language and learning challenges. So perhaps, it is more productive to look at what it was really meant to do, and then decide if it truly does work. According to Dr. Martha Burns, language processing can be broadly divided into three hierarchical levels: Low Level (Perceptual Skills or Listening skills), Mid Level (Grammar and Vocabulary), and High Level (Complex Problem Solving). If the three levels are viewed as a pyramid, the Perceptual skills would form the base, Grammar and Vocabulary skills would form the middle portion, and Problem Solving skills would form the tip of the pyramid. As you can imagine a shaky foundation or base could potentially cause the entire pyramid to fall. Our ability to quickly perceive (listen to) sounds, tell if two sounds are same or different, put sounds together to form words, and also manipulate sounds to change words and their meanings is truly the foundation of language. Several conditions in young children can lead to impairments in these Low Level processing skills. Autism, ADD, ADHD, middle ear infections, and seizures are only a few conditions that lead to these impairments. The goal of the Fast ForWord programs, therefore, is not repair high-level problem solving skills, or even to teach grammar and vocabulary. The primary focus of Fast ForWord is to enable a child to perceive miniscule changes in speech sounds that occur at a rapid rate during spontaneous conversation or classroom lessons. Of course, this may result in changes in mid- and high-level processing, but these changes are a product of the progress seen in low-level processing. However, this does not eliminate the need for more traditional individual therapy to work on grammar, expanding vocabulary, and problem solving. In fact, Fast ForWord may make traditional behavioral approaches more effective and productive. One of the criticisms of Fast ForWord has been that a clinician can target the areas addressed by Fast ForWord. Traditional auditory processing therapy focuses on skills such as following directions, phonological awareness, and auditory recall. While Fast ForWord targets the same areas, traditional approaches are merely asking the child to do things that are already challenging for him without making any modifications to the stimulus. Clinicians attempt to change the stimulus by saying it slower, or louder, or by using headphones to eliminate noise. While these are beneficial to some extent, they do not take into account the core deficit that many students face in terms of auditory processing: the speed with which sounds change within words. It is impossible for humans to stretch the speech sounds to reduce the rate. At present, the only software that can achieve this is Fast ForWord. Thus the traditional approaches provide compensatory strategies without really addressing the core area of deficit. In my experience, it is rare to find sudden dramatic changes that encompass all language areas after a few weeks, or even a few months of Fast ForWord. It appears that although Fast ForWord drives neurological changes in the white matter tracts of the brain, these changes are not evident in a vacuum. They must be supported by behavioral intervention that targets higher-level language processing. In a crux, it just seems like Fast ForWord works best when it is done in conjunction with language therapy that targets mid- and high-level skills. 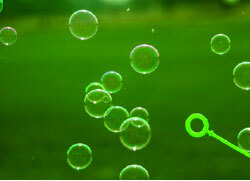 Are you having trouble squeezing in time to develop novel therapy materials for your social thinking groups? You’re not alone. With a crazy schedule of both private and public school speech therapists, this new pack of cards is an incredible time-saver. The Superflex Superdecks are card decks to help your students practice and promote the skills they learned in the Superflex Curriculum. It is important to note that the card decks do not replace the curriculum, but in fact supplement it. I used them after my students were at least familiar with the Unthinkables and the Superflex strategies. So if you’re looking at this set, consider purchasing the Superflex Curriculum and comic books first. The card decks are meant for kids between ages 8-11 years. Unthinkable Card deck which includes 14 Unthinkables (2 each), 6 Superflex Cards, 18 Brain Sensory Cards. Situation Card deck which includes 5 Power Pat cards, 47 situation cards. Strategy Card deck which includes 52 Strategy cards. Thinkables Card deck which includes 14 Thinkables (2 each), 6 Superflex cards, 18 Brain Sensory cards. An Informational and General Instruction booklet. Even though I’ve been using the Superflex curriculum for a while now, it was really helpful to look through the Informational and General Instruction booklet. There was a lot of useful information about what’s included and general instructions about using the game. The reference cards are an excellent visual to review all the Unthinkable and Thinkable characters. I spent a lot of time with these cards before using the card games. A good understanding of these characters is crucial to this program. The 5 Step Power Plan includes the 5 Power Pals who will help the students review the steps to take in a socially tricky situation. I like the clean visual. I made several copies of this card and will sometimes have the students write or draw what the 5 Power Pals would do in each situation. The Thinkable cards can be used as a game such as “Put ‘em to Rest.” The object of the game is to identify which Unthinkable is put to rest by the Thinkable. (The answers are on the back of the instruction card). You can build on this by asking your student to come up with a “Thinkable” moment and describe the Thinkable’s superpower. The Unthinkable cards are used to play the “On the Scene!” game. The object of this game is to describe a time and situation when the Unthinkable character may make an appearance. The Situation card deck contains various social situations where the Unthinkables appear. The object of the game is to identify which Unthinkable may be at work in that situation. (It might be useful to keep the reference cards for the characters handy for this game.) The situations are realistic and easy to relate to for most school-age students. You can also go on the Social Thinking website (www.socialthinking.com) for a blank template to make up more social situations. The Strategy card deck contains possible Social Thinking strategies to use when the Unthinkables usually make their appearance. The object of the game is for the student to identify, which Unthinkable can be defeated by the strategy on the card. Since our focus is almost always on thinking of strategies when a situation is presented, I think it is really useful to work in reverse sometimes. It helps solidify the concept. *Even though you can play the card games by themselves, some of my students prefer to use them with their favorite game (just like you would any flashcard set). Overall: The Superflex Superdecks is a fun, engaging and motivating game to review and practice the Superflex Curriculum. I love the idea of creating your own Unthinkable characters and situations using the templates on the website. Even though the instructions for the card sets are provided, it is easy to create your own games to make it more exciting for your students. On days when the kids seem particularly lethargic and slow, we used the Unthinkables card set to play treasure hunt. I hide the character cards and the students take turns to find them. They then describe what the Unthinkables do in a social situation and come up with a strategy to cope with them. Really, the possibilities are endless! I definitely think this game is an excellent buy for around $40. You can purchase your set here. Disclaimer: This item was provided to complete this review. No other forms of compensation were provided. The thoughts and opinions expressed in the review are the author’s. Amelie began using Speak for Yourself (SfY) independently as long as a single button was open on the screen. She was using it consistently for about two weeks in the therapy room, at home and at school. Despite the enormous success, we knew it was too early to pat ourselves on the back. Having just one button open on the screen while she uses it to make requests wasn’t functional. It was critical that we started opening up the buttons that were familiar so she could discriminate and choose the one she wanted. So during one of her sessions, I tried opening up two buttons (banana and peach). She was familiar with both words. However, the only snack we had was a banana. We didn’t have a peach. We started the session by displaying her snack (banana), and then placing her iPad (now referred to as her “talker”) in front of her. By now, she knew the drill. Like a pro, she hit “eat” which lead her to the secondary page. Now, instead of just one option, there were two. The couple of times she hit “banana” there were no problems. But, when she hit “peach” and I said “Oh, sorry, we don’t have peach today,” there was a meltdown. If she could talk, I know she would be saying, “But I hit the button! What more do you want?! !” After a few episodes, I found myself thinking, “Gosh I wish there was an easier way to do this.” It made me think of an old PECS® training I had attended many years ago. They work on discrimination by pairing a highly desired object with something the child did not care about. So for the next session, I asked mom to send a food item that Amelie doesn’t like (pickles) along with her favorite snack. So this session I displayed the two snacks and placed her talker in front of her. Once again, hitting “eat” was easy. Again, two options were open on the secondary page: a desired item (banana) and a non-preferred item (pickles). This time, when Amelie hit “pickles” and was presented with pickles, we didn’t have a meltdown. She looked confused. She even tried putting it in her mouth. She spat it out after a few seconds and instead of crying, she reached for her talker again. While this may not seem like a huge deal, to her nanny and I who waited for her outburst with our breaths held, it was an enormous achievement. For the next few trials, every time she hit “pickles,” she shook her head as if to say “no, no, that’s not it,” and then went ahead and hit “banana” instead. Suddenly it seemed that she realized that different buttons meant different words. She understood that because I gave her the pickle when she asked for it. Having her press a button and then say “Oh, I don’t have that,” was too much to process through her frustration. Now that she understands the concept of different buttons for different words, we are seeing a dramatic decrease in tantrums and meltdowns. I can now say, “I’m sorry, there’s no more banana. Would you like grapes instead?” There are no more tantrums. She reaches for her talker and tries again. Hindsight is always 20/20. I think I should have worked on discrimination earlier than I did. I don’t think Amelie needed the two weeks I gave her to familiarize herself to her talker. Instead of closing all the buttons except the one she was requesting may not have been necessary. In the long run, I don’t think that two weeks is a lot of time lost, but I know that in the future I will push a little harder and move a little faster. While there is the occasional drama when she hits the wrong button sometimes (truthfully, it wouldn’t be Amelie without the drama), the big picture is that she has almost a dozen words on her talker that she can use to make a choice. I had the opportunity to listen to a recorded presentation “Neurobiology of Autism: Interventions that Work by Dr. Martha Burns, PhD, CCC-SLP on current research in the field of neurobiology of Autism. The original presentation was delivered in November 2013. Dr. Burns is one of the leading researchers in this field. The purpose of the presentation was to summarize the new research in the area of neurobiology as it pertains to children on the Autism Spectrum. The reason I was intrigued was because it explained autism in a way that, for me, finally made sense. Not only did it explain (in theory at least) why children on the autism spectrum demonstrate the characteristics that they do, but also why almost every autistic child presents differently from the others. The purpose of this blog isn’t to recreate Dr. Burns’ presentation, but to quickly highlight the salient points for parents and other professionals. However, I highly recommend listening to the actual presentation since there were so many details embedded within it that are beyond the scope of this blog. Etiology of autism- In summary, Dr. Burns narrows the causes of autism to genetic mutations (age of parents, environmental factors causing mutations in the fetus) and neurotoxicology (certain antibodies in the mother may enter the amniotic fluid and these can cause autism). In essence, Dr. Burns refutes theories that suggest that diet and immunizations may be possible causes of autism. Neurobiology of Autism- This portion of the presentation discussed the use of “Diffusion Tensor Imaging” (an imaging technique that is more sophisticated than MRI scans). Using this technology, researchers were able to map white matter fiber tracts. These fiber tracts develop in individuals from the 3rd trimester until about 30 years of age. These are long fibers tracts that run across multiple lobes of the brain. Some of these fiber tracts in the left hemisphere of the brain impact speech development and auditory processing. Because these fibers are long, they are particularly vulnerable. According to Wass (2011), autism is a disorder of long white matter fiber tract development. A study by Wolf, et. al. (2012) also surmised that there was aberrant development of white matter fiber tracts in children with autism spectrum disorder. They also found that the fiber tracts in infants up to about 6 months of age are similar in typical children and children on the autism spectrum. After 6 months of age, they noticed a blunted development in these longitudinal fiber tracts in children with autism. This explains why often parents report that their children appeared typically developing in infancy and the autism-like symptoms were not present until later. Researchers have also found that the development of these fiber tracts is different among children with autism. Hence we see a great diversity in skills, abilities and deficits in children on the autism spectrum. In addition, since the longitudinal (long) fiber tracts are insufficiently developed, the short tracts that are overused. This results in an increase in repetitive and stereotypical behaviors, so frequently seen in children on the autism spectrum. Just as the white matter fiber tracts in the left hemisphere of the brain impact speech and language development, fiber tracts in the right hemisphere impact social skills and pragmatics (Stanley & Adolph, 2013). Researchers believe that it is the low level processing (perceptual skills) that drives the white matter tracts. 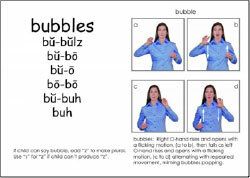 These perceptual skills can be impacted effectively through computerized programs such as Fast ForWord®. However, it important to note that perceptual skills should not be addressed in isolation. 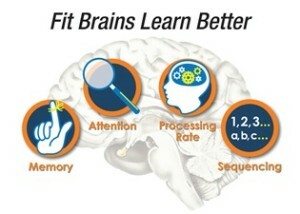 The most effective interventions should therefore include computerized approaches that drive neuroplasticity and behavior interventions for functional limitations. While new research that explains Autism is enlightening, what is truly exciting for me, is the knowledge that we can now tailor interventions and treatment programs so that they are truly effective. After spending a few sessions working on speech sound production, and signs, we noticed some good progress with her imitation of labial sounds /p/, /b/, and /m/. But it was soon obvious to all of us that Amelie’s speech production and her repertoire of signs was insufficient to meet her communication needs. We needed something that was functional, portable, easy to use for both Amelie and her caregivers, and wouldn’t cost an arm and a leg to purchase. After some research and comparisons, it appeared that the iPad app “Speak for Yourself” might work for Amelie. While everything appeared perfect on paper, we knew we had an uphill battle getting Amelie to use anything other than her signs of “please + more” to request for something. Like we expected, the first few sessions with the app were challenging. Between her protests, she attempted to hit the icons no more than 2-3 times during the entire 45-minute session. While it was discouraging at first, I knew we had to try it a few more times before giving up. For the next session, we closed all but one button on the screen (e.g. eat or give) and then one button on the next screen (e.g. banana or a preferred toy). However, despite all our attempts, Amelie would randomly hit the iPad screen or run her fingers across as if to scroll, or hit the home button. It wasn’t the best start and I felt myself wavering, wondering if I should perhaps try something else instead. But sometimes, you just have to trust yourself. (It certainly helped that Amelie’s parents and nanny are incredibly supportive and like me, felt that we were on the right track and needed to give Amelie a little more time). I decided to try it for another session. I’m not sure what changed, maybe the stars were aligned, or maybe she was hungry and really, really wanted that banana. That day, there were no protests. With minimum support to her elbow, Amelie isolated her finger and hit both buttons (eat and banana) to request her snack consistently for ten consecutive trials. Then, she did it again for grapes, and again for a spinning top, and again for her favorite princess wand. Two weeks later, she was requesting for items using Speak for Yourself on her own without adult support, not only in the clinic, but also at home. I know that this is only the beginning. I know that we have a long, long way to go. But the mere fact that we have moved beyond signing “please” + “more” for everything, is already a huge step. Most importantly, she now has a communication system that works for her and can grow with her. We finally found a voice for Amelie. Stay tuned for new blogs to keep you updated on Amelie’s progress with Speak for Yourself. A few years ago high tech AAC devices with dynamic displays involved heavy, cumbersome apparatuses that cost thousands of dollars. With the advent of tablets and iPads, it seemed inevitable that technology would pave the way for augmentative and alternative communication systems to now be accessible to all. I have several clients that are diagnosed with severe apraxia of speech that are predominantly non-verbal. While speech production is the focus for most of these families, the reality is that communication must come before speech. (See one of my favorite blogs: http://niederfamily.blogspot.com/p/hi-if-youre-here-i-likely-crossed-paths.html). Dana, the author of the blog, “Uncommon Sense” explains perfectly how important it is to establish a communication system while working on speech production. As a PROMPT and oral motor trained therapist, I couldn’t agree more. With a wide array of options that are now available, it is often confusing for a new therapist to pick the right app for their client. The truth is that there really isn’t a “one size fits all” app. The two more popular apps are “Proloquo2Go” and “Speak for Yourself.” I have tried both apps on a few of my clients. I made a “pros” and “cons” list for both the apps, which, I hope, will help parents and other therapists make a choice when selecting a suitable AAC system for their little ones. The button sizes can be customized so you can potentially start with larger buttons and therefore bigger images. However, as you add buttons the size will decrease to accommodate the additional buttons. It is fairly easy to customize the background colors and the colors of the buttons to make them stand out. There are 2 vocabulary sets (core and basic). The core vocabulary is for students who are combining words to form utterances. Most frequently used words are on the home page and other words are in folders on additional pages. Basic Vocabulary is for students using the device mostly to request and can’t yet navigate through pages. You can customize the number of buttons per page. For basic vocabulary, the grid can be as small as 3 X 3 buttons. In addition, you can remove buttons so you could potentially have as little as 1 button on the screen at a time for beginning users. 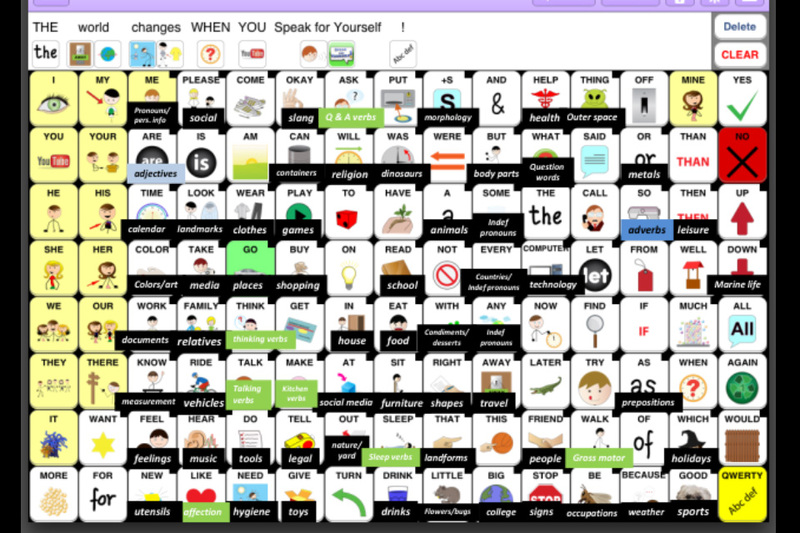 The Core Vocabulary contains academic vocabulary (e.g. calendar, numbers, colors, shapes, etc.) that is pre-programmed. I can see how teachers, especially preschool and kindergarten teachers would find this helpful. The biggest con for me is that it does not really use motor planning. You can potentially move the placement of the buttons around so the users aren’t really using motor planning or muscle memory while using the device. If you add new vocabulary to the page or change the grid size, the buttons automatically get shifted. To understand how important this is, consider a task such as typing. If the keys were moved to new locations, it would make a relatively simple task of typing incredibly tedious. Our fingers use the muscle memory and motor planning to locate the keys. If AAC users could use the same skills to access vocabulary and language for communication, it would indeed be a huge asset. Words can be duplicated and be placed in different folders, making it very confusing for the user. While the core vocabulary is a good start for users combining words to formulate utterances. However, locating words to formulate sentences can sometimes be cumbersome and requires opening several pages and folders to access the vocabulary. It uses motor planning. The position of a button never changes. It will always stay at the same location. The users can therefore rely on muscle memory to access frequently used vocabulary. It has the “hide and open” feature so you can hide as many of the icons as you want. You could potentially have just one button open at a time. This is a good level to use to introduce the app to new users. It has the “babble” feature so users can explore the language and words on the app without changing any of the programming. It only takes a maximum of two buttons to access a word. It won’t let you record a word twice. So each word can only be programmed in one place, making it easier for children to remember where the symbol is located. The buttons are small so some of my younger clients had trouble accessing the buttons. This can be very frustrating sometimes. However using a key guard could potentially be helpful. You can’t really change or customize the size of the buttons. You can’t over ride the function, which only allows you to program a word once. For example, one of my clients loves to play with a top. I tried to program “top” in the page with the other toys, but it wouldn’t let me since “top” (the preposition) was already programed in another location. This is usually easy to get around by using a different label for the object. For example, I used “spin top” and used a photograph of the top my client likes. Both the apps are similarly priced at approximately $200. Overall, while the motor planning element makes me lean slightly in favor of the SfY app, several of my clients prefer and do better with Proloquo2Go. I think it truly reinforces something we’ve always known: AAC systems are highly personal and something that works for one child need not work for another. Some of the areas of language that we can target using this strategy are: participation, turn taking, prosody, intonation, and vocabulary. I Ain’t Gonna Paint No More. In her presentation, Shari also talks about building Phonemic Awareness skills and vocabulary, which are so important for all our children with language delays. In addition, these strategies are so simple that they are brilliant. They are easy enough for parents to pick up and carry on at home. One of her quotes that stuck with me was “Children learn to talk by talking, they learn to read by talking AND reading.” Additional resources for the program are available at www.dynamic-resources.org. The second part of Sam’s treatment for vowels was the speech production or articulation portion. We began by targeting the round vowels such as /Ʊ/. A lesson plan was created that included auditory bombardment, production of the sound in isolation with PROMPT and tactile cues, production of the sound in words using a functional or communication task, and production of the sound in a word using drills. For the round vowels multiple tactile cues were provided to elicit the lip rounding. The TalkTools Tactile Tubes were particularly helpful. Since they come in different diameters, different tubes were used to elicit different sounds. Initially the use of Renee R. Hill’s and Sara R. Johnson’s Ice Stick was also very helpful to elicit lip rounding. The added thermal stimulation provided by the cold Ice Stick yielded some good results. The Ice Stick placed horizontally was used to elicit lip retraction for vowels such as /i/. In addition, two Bite Blocks placed between the molars simultaneously on both sides also assisted with stabilizing the jaw height while aiding lip retraction. Following the principals of Hodson and Paden’s Cycle’s Approach, a vowel was targeted for a few weeks and then a new vowel was selected. Once all the sounds were targeted, the same targets were then re-cycled. The functional or communication tasks were the highlight of the session. This portion is important since it gives us as therapists the opportunity to shape the sound in one phonetic context using multiple trials. For example, when targeting the “ee” sound, I used the Honey Bee Tree game. I worked on the words “tree” and “leaf” when Sam placed the leaves on the tree. When he pulled the leaves out and the bees fell, I targeted the word “bee.” I try to elicit the word at least 8-10 times per activity. In a half hour session, I try to include at least 4-5 similar communication activities. Apart from being able to target the same word through multiple repetitions, the communication task also gives the child an opportunity to use the sound in a meaningful way rather than simply naming pictures in a drill. As a part of the generalization portion of the lesson, I would have Sam’s parent lead one of the activities in the clinic (so Sam can produce the target word with a person other than me) and I also provided the parents with a copy of the drill pictures to practice at home.